Lots of home improvement enthusiasts love the great old DIY jobs. Some projects, for reasons of skill, aesthetics and safety, though, are best contracted out to skilled professionals. The bigger the job the more important is the need to get the best commercial contractor for your needs. Here then are some tips to help you hire a contractor. 1. Start with realistic expectations. The fact that you’ve made the big plunge and committed to a super reno doesn’t mean you’ll actually be able to get things moving as quickly as you’d like. The rule of thumb to remember is that good contractors will be booked two to four months in advance. (Bad contractors, as a general rule, are immediately available, but let’s not go there.) So, when you start calling around, don’t be annoyed or insulted when they don’t get right back to you. Imagine if they were on-site working on your home; would you want them answering their cell phone every 10 minutes? No you won’t and neither does their current client. If they’re good contractors they’re working and you’ll have to wait until they’re away from the job site to get a call back. Depending on the volume of messages they get, it can take a few days to get back to you. Be patient. The good ones are worth the wait. 2. Get references: Delay in returning your calls, though, is hardly the standard by which we want to decide upon the likely skill of a contractor. What you’ll need are references and the benefit you get from this tip will rely upon how much effort you put into it. I suggest that you talk to family members, friends, and trusted colleagues at work or leisure associations. Ask them about their experiences hiring different kinds of contractors. The more people you ask, the more detail you solicit, the better informed you’ll be and the more likely to make a choice that will bring you happy results. You’ll hear lots of horror stories, that is certain, but you’ll also find those gems: stories where people who rave about the great prices and wonderful service they received. Prudence calls for taking even the best stories with a grain of salt. 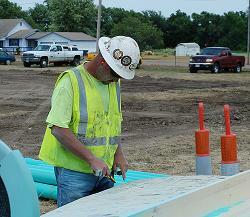 Many contractors do a wide range of work. If what you’re looking for isn’t the same job as was performed by the person giving the glowing reference, you may not get the same spectacular results. However, it’s always preferable to begin work with someone who has a track record of providing great satisfaction to someone whose judgment you trust. 3. Get Competitive Bids. At the end of the day, no matter how many references you have and how glowing they may be, you’ll have to hire a contractor that is right for you and your home. Plus, there are some basic considerations for hiring any contractor that everyone needs to consider. Always get as many quotes as possible. Depending upon your budget, though, don’t let yourself necessarily be scared off by higher bids. Sometimes these reflect higher skill levels, greater experience and more market demand due to these qualities. Sometimes it is worth paying a little more to get a lot more benefit to your home improvement dreams. Can your contractor work within your budget? Does he suggest alternatives to save you money (even if he loses a bit in the process)? If he exceeds his schedule are there consequences for him (like savings to you)? Does he have liability insurance and can he provide documented proof of it? With all those tools around, his crew could accidentally damage your property and you don’t want to have to worry about the headache of small claims court. Is he licensed? It may seem silly and obvious, but you’d be surprised. Sign a contract confirming his liability in the event you have to redo any of his work later, due to code-related issues. Contracts generally are a wise idea. Ensure that you have legal recourse if he bails on your project. Again, sad to say, but it does happen. Arrange a beneficial payment structure that includes milestones and of course don’t pay in full until the project is complete. If you get enough bids, something in the middle area of the range, provided all the above issues are satisfactorily addressed, will probably be about the right cost for realizing your project. However, for those of you who either don’t want the hassle of finding a good, reliable and cost efficient contractor or can’t afford the expense, it’s certainly true that there’s no more reliable and cost efficient contractor than yourself. 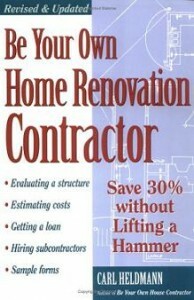 This is a big undertaking, but if you think you’re up for it, you should have a look at Carl Heldmann’s book Be Your Own Home Renovation Contractor: Save 30% Without Lifting a Hammer. Whatever path you choose, there’s no substitute for being well prepared and thoroughly informed!